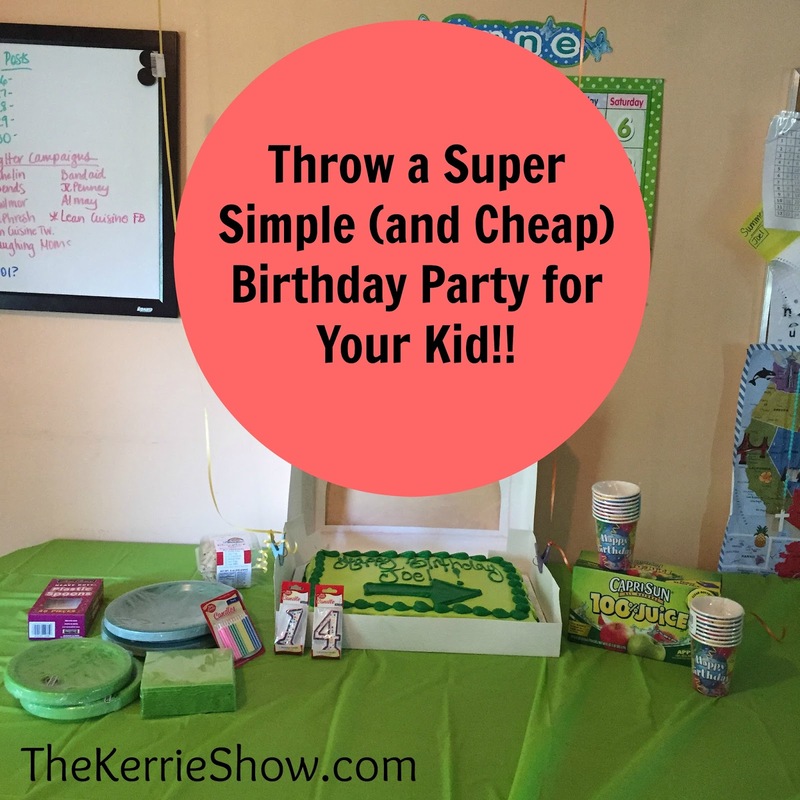 The Kerrie Show: Throw a Super Simple (and Cheap) #Birthday Party for Your Kid!!! 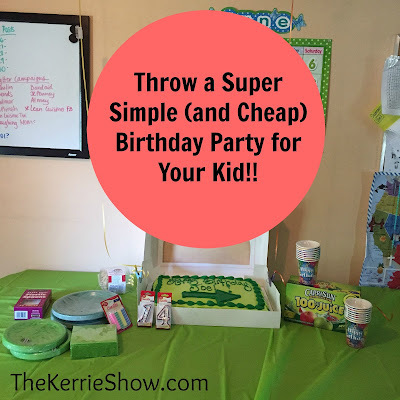 Throw a Super Simple (and Cheap) #Birthday Party for Your Kid!!! It seems like kids’ birthday parties are getting out of hand these days, with parents trying to top each other for the Most Elaborate Party award! Why break the bank for an off-site birthday party for your child when you can do it yourself on the cheap? This year, consider giving your child the Ultimate Birthday Party, one where he can play, have fun and just be a kid. The added bonus is that you get to keep your sanity and money. Follow these steps (some of which go against everything you’ve ever read about birthday parties! ), and you’ll have a stress-free celebration everyone can enjoy. 1. Either call or E-vite.com family and friends to save the cost of invitations and stamps. Invite them to your home or maybe even to a park shelter that you reserve in advance. Set the party time for 1 p.m. so guests know lunch won’t be served (think of the cost plus set-up and clean-up!). Make the pick-up time clear; a couple of hours is usually plenty of time for a good shindig. 2. The night before the party, bake the cake (from a box, of course!) or cupcakes. Feel free to get fancy on the cake if you have that talent; otherwise, most kids are just thrilled to have sugar in any form. You could even bake a special small cake (maybe heart-shaped!) just for the Birthday Kid and let him decorate it himself. 3. On party day, don’t worry about setting up a craft or handing out costly goodie bags for the kids. Most parents these days are into de-cluttering and find their kids have way too much junk. Craft and goodie bag paraphernalia will likely just get thrown away later. Parents will appreciate not having to take home anything except for their child, and won’t feel guilty because you spent more on a goodie bag than they did on your child’s gift. 4. To kill some time, consider a piñata (filled with something quickly disposed of like candy or fruit snacks instead of junky toys). Otherwise, kids don’t need every minute of their day scheduled for them … running wild is what they are best at, especially at a birthday party! 5. Assign one adult party-goer to take pictures and one to take video of all the fun (including the opening of gifts and blowing out of candles) so you can concentrate on celebrating with your child and keeping track of the other kids. 6. Make the decorations simple, especially for younger kids who probably don’t watch enough television to even have a favorite cartoon character. Colored paper plates work great, as do regular plastic forks (recycle those forks if you’re going green!). Rather than buy expensive Mylar balloons, blow up some store-bought colored balloons yourself and tape them to walls and doorways or leave them loose on the floor. 7. Have a basic order of events in place to keep things moving along. For instance, you could have the kids play until everyone has arrived, then open gifts, sing “Happy Birthday” and eat cake and ice cream, which would lead into the piñata, and end with more play until the party’s over. 8. Make sure your child thanks each gift-giver as she opens her gifts. If your child is running around as everyone leaves and can’t thank everyone a second time, go ahead and do it for her. This way, you don’t have to send thank you notes after the party, which just takes more time and money and is yet another thing that ends up in the garbage. 9. Speaking of gifts, are you tired of your kid receiving so many gifts at a birthday party that you can’t even find a place to put them all? Melissa, mom of one, said she (or was this her kids’ idea?) asked guests (when her kids were little?) to bring canned goods for Harvesters instead of gifts. What a way to teach the Birthday Boy or Girl, as well as his or her guests, about gratitude and going green! 10. If you have older kids (ah, tweens! ), Jen Wood, mom of 2, thinks pizza and a movie at home, followed by a sleepover, is a great bet. Want more mom fun? Sign up for an email subscription and get me in your inbox!